Bahama Weddings cakes … Anything can inspire the design of your wedding cake. Today we feature wedding cakes to spark your creative juices. 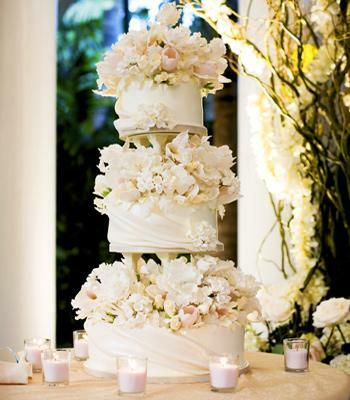 A Sylvia Weinstock cake from Destination Weddings and Honeymoons Magazine … Three-tier vanilla cake with hazelnut and cannoli filling and decorated with realistic-looking sugar flowers — roses, peonies and hydrangeas — to match the other flowers throughout the wedding. In addition to dessert feature as part of a three-course meal, wedding cake is also served as dessert. These cakes are The Knot.